Mentoring is a developmental relationship in which a more experienced or more knowledgeable person helps to guide a less experienced or less knowledgeable person (definition from Wikipedia). Mentors give feedback for the protégé to consider. Learn from success and failure of other diaspora members. Make connections for particular diaspora value and benefit. Understand concerns of diaspora culture, language, ethnicity. Leverage home-country context to support the community. Global diaspora technology usage is both like and unlike that of other social communities. Technology such as cellphones, mobile banking, healthcare solutions, social media, and philanthropy may all be approached and implemented in new ways by the diaspora. Protégés twice as likely to receive a promotion. Twice the number of “superior” annual ratings. 88% partners worked across distance (not local to each other). Multifactor matching process based on a database of successful prior mentoring relationships. Cross-organizational matching (bringing together protégés and mentors from a variety of locations and companies). Easy to use software to support and enable partnerships. Automatic metrics reporting to track and manage success. Trained professionals to add human understanding to the algorithms and databases. People to People is now planning several mentoring programs. Please volunteer to be a P2P mentor when the call goes out for volunteers! Top professionals in every field routinely attribute their success to their mentors. 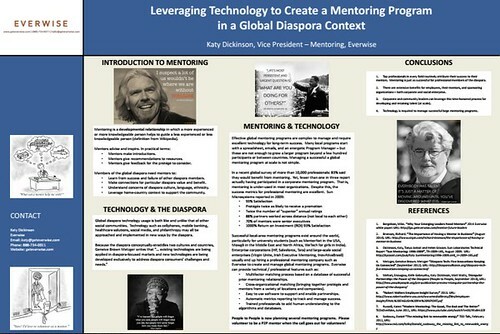 Mentoring is just as successful for professional members of the diaspora. There are extensive benefits for employees, their mentors, and sponsoring organizations – both corporate and social enterprise. Corporate and community leaders can leverage this time-honored process for developing and retaining talent (at scale). Technology is required to manage successful large mentoring programs.